Sports Rendezvous: Liverpool weather Roma storm to roar into Champions League final. Liverpool weather Roma storm to roar into Champions League final. Is it too presumptuous, when Liverpool are playing with this kind of attacking conviction, to believe they have the riches to prevent Real Madrid, the most successful team in the history of the European Cup, from registering a 13th success in the competition they cherish the most? The final will be on 26 May in Kiev and Liverpool, on this evidence, will be going to Ukraine to score goals and examine the theory that Madrid can be susceptible at the back. Evidently they will need to tighten up their own defence, eliminate the mistakes that briefly threatened a late twist here and hope their goalkeeper, Loris Karius, is not having one of his accident-prone performances. Attacking-wise, though, it is certainly within their reach to ensure another year, 2018, needs to be added to all those banners on the Kop – many of them visible here in Rome – acclaiming their previous wins in 1977, 1978, 1981, 1984 and 2005. 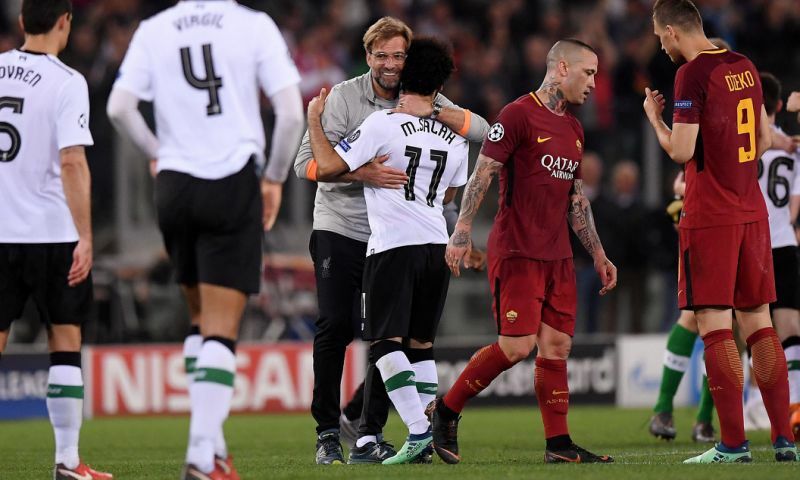 Jürgen Klopp’s team have now accumulated 46 goals, qualifiers included, in this competition and Sadio Mané, Mohamed Salah and Roberto Firmino have 31 of them. True, they will need to find a way to subdue Cristiano Ronaldo et al but if there is one certainty about this Liverpool side it is that they will attack with vigour and confidence. Full story at Yahoo News.